Hejduk Saves Face? - Archpaper.com Hejduk Saves Face? We recently reported on the defacement of John Hejduk’s Kreuzberg Tower and Wings in Berlin, the architect’s poetic 1988 project built as part of the IBA program. 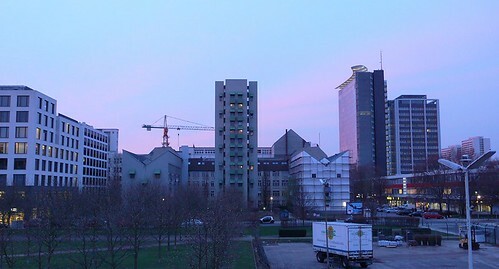 After an international outpouring of angst over the developer’s “renovation” of the building—in just two weeks, more than 3,000 people signed an online petition, with testimonials penned by architects including Peter Eisenman, Steven Holl, Thom Mayne, and others—the building’s managers, BerlinHaus GmbH, have now said they will meet with the design community to take public opinion into consideration, and perhaps rethink their plans. The Berlin Senate has convened a special “baukollegium” to look into the specific matter of my father’s building and the general matter of guidelines and stewardship of the IBA ’87 buildings. I’m flying to Berlin on Friday to meet with the Senate members who are now on this special commission and, apparently, the architect for the developer, the developer, as well as myself (with a couple of the architects from Save Hejduk posse) will be presenting at this meeting. Thus far, representatives from the Berlin Senate have personally expressed their support for the Hejduk building, and the broader international response has had a major impact. “The support of the international architectural community has been astounding for all involved, and has definitely been a major factor in shifting the discussion,” Robert Slinger, an architect and one of the preservation campaign’s advocates, told AN.